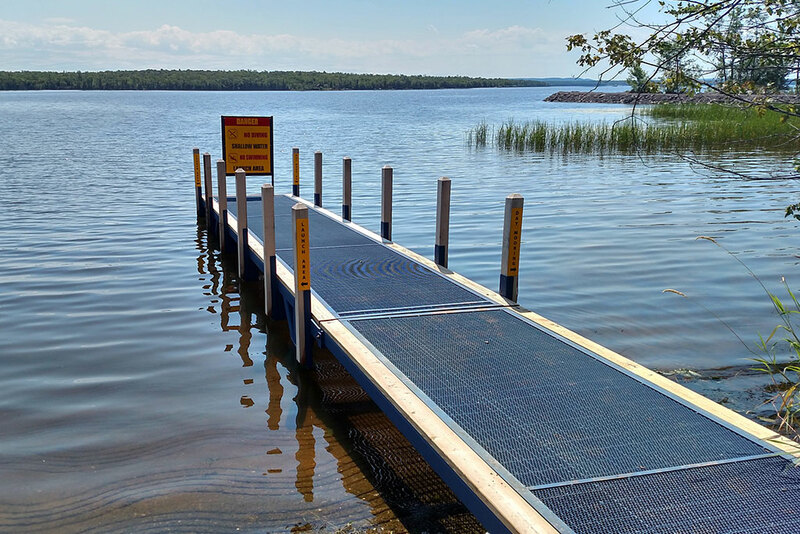 BERGLAND – Work began in July along Lake Gogebic to improve the Michigan Department of Natural Resources’ Bergland Dock boating access site has been completed and the site has been reopened. The access site was temporarily closed July 11. Improvements made include the removal of a wooden dock along the pier and installation of riprap to armor the side. Additionally, the parking lot next to Bergland Park was dug out to remove sawdust and poor subsoils, refilled and capped with gravel. An aggregate path, compliant with the federal Americans with Disabilities Act, was installed to provide access to the pier and the park’s pavilion. An additional courtesy pier was placed at the site to assist with launching and provide day-only mooring. In addition, dusk-to-dawn lights are scheduled to be installed to provide ample lighting. Funding for the project was provided through the Waterways Capital Outlay Fund, which is derived from boater registration fees and marine fuel tax revenue. Share the post "DNR reopens Bergland Dock boating access site"
Categories: Featured, Hunting & Fishing, and Ontonagon County.